A Russian Soyuz spacecraft carrying a U.S.-Russian-Dutch crew returned to Earth on Friday from the international space station, landing on target in the steppes of Kazakhstan. The snug Soyuz TMA-3 capsule carried American astronaut Michael Foale and Russian cosmonaut Alexander Kaleri, who spent some six months on the ISS, and European Space Agency astronaut Andre Kuipers of the Netherlands, who returned after a nine-day mission on the station. "We landed amazingly softly," Kaleri said as he sat in a chair outside the capsule, alongside his two crew mates, wrapped in blankets and sipping hot tea to stave off the early-morning chill. "A bull's-eye touchdown for the crew," said NASA spokesman Rob Navias, on the scene in north central Kazakhstan. "It's a brilliant morning, the sun is just beginning to rise, crystal clear skies, just perfect weather, no wind at all... A very jubilant scene here in north central Kazakhstan." Sean O'Keefe, the administrator of the U.S. space agency NASA, monitored the landing at mission control. He said it was "flawless." "It was a testimonial to the depth of the partnership of the International Space Station," he said. The homeward journey took about 3 1/2 hours, ending on the vast, wide-open steppes of Kazakhstan at 4:11 a.m. Moscow time. The first helicopter reached the site within minutes and its crew reported that the capsule was lying upright, on its bottom. 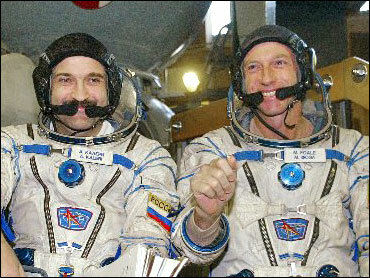 Russian space officials at mission control outside Moscow said the crew is feeling fine. Search and rescue helicopters glimpsed the space capsule as it neared the ground, and the space officials broke into applause when the landing was reported. It is the third time an American astronaut has come back to Earth aboard a Russian craft since the U.S. manned space program grounded its shuttle fleet following the February 2003 Columbia disaster. The landing of the space station's previous American-Russian crew in October was smooth and on target - unlike the dramatic landing of the first American astronaut in a Russian Soyuz capsule in May 2003, when a computer error sent the crew on a wild descent 250 miles off-course. Col. Mikhail Polukhin, coordinator of the Russian space agency's search and rescue operations, said Thursday his men had been prepared for any situation but added there was no cause for worry. Russian space officials said Wednesday that the Soyuz spacecraft, which had been in space for six months, was leaking helium. But both Russian and American space officials said the leak was very minor and would not affect the landing. Helium is used to pressurize the Soyuz craft's fuel tanks for its de-orbit descent. Navias said the leak was discovered after the craft's October launch but said there was "plenty of helium" onboard to allow normal landing. With less than an hour to go before the scheduled landing, the Soyuz fired its engines to slow its descent and put it into the right trajectory for reaching its planned destination on Earth. Space officials at mission control said the operation went smoothly, proving that the helium leak posed no threat. Foale and Kaleri formally handed over the station to Russian Gennady Padalka and American Michael Fincke when they climbed into the Soyuz TMA-3 and closed the hatches between the station and the spacecraft. Kuipers was on the station under a commercial agreement between ESA and the Russian space agency.